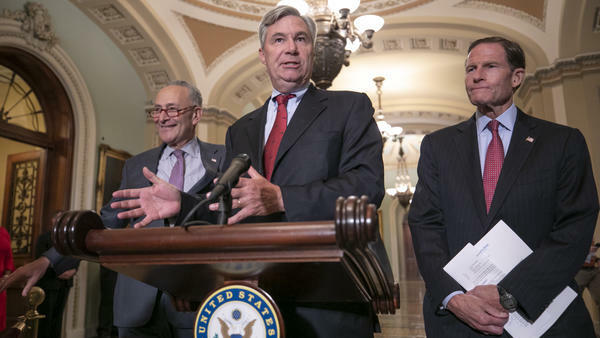 Sen. Sheldon Whitehouse, D-R.I., flanked by Senate Minority Leader Chuck Schumer, D-N.Y. (left), and Sen. Richard Blumenthal, D-Conn., at a news conference Thursday, where they said they will sue the National Archives if they don't get the documents on Supreme Court nominee Brett Kavanaugh that they requested. "We stand ready to sue the National Archives for Judge Kavanaugh's full records if necessary," Schumer said. "The American people deserve a methodical and thorough examination of a nominee to the Supreme Court who will yield immense influence on their lives." Democrats filed their FOIA request with the archives Aug. 8. They also sent similar requests to the Department of Justice, the Department of Homeland Security and the Central Intelligence Agency. They gave notice on Thursday they will file a legal challenge specifically against the National Archives if their request is not fulfilled within 20 working days. This sets up a Sept. 6 deadline that could trigger a lawsuit on the third day of the planned confirmation hearings. Democrats criticized Senate Judiciary Committee Chairman Chuck Grassley, R-Iowa, who they argue is rushing Kavanaugh through the confirmation process without sufficient information available on his record. Grassley defended the committee process Thursday as "the most transparent confirmation process." "We're working with the National Archives and President Bush to make as many documents publicly available as quickly as possible," Grassley said at a hearing on the document process. Staff at the National Archives informed Democrats earlier this week that they expect it will take until late October for the full set of remaining documents to be released. Republicans are relying on files from the George W. Bush Presidential Library to vet Kavanaugh — a process Democrats say is out of step with common practice. They say GOP-affiliated lawyers at the library are vetting and redacting the files. "The small percentage of documents the Judiciary Committee will get to see are being pre-screened by a Republican operative," Schumer said. Schumer also announced that he plans to meet with Kavanaugh in person next week despite the ongoing document dispute. Democrats say they are particularly interested in any documents that may show how Kavanaugh might rule on presidential privilege. Schumer said the issue could come before the Supreme Court in the coming months as part of the investigation led by special counsel Robert Mueller. "Kavanaugh has said so many things about limiting presidential power and holding presidents accountable. So it matters what Brett Kavanaugh thinks about this because this case may come before the Supreme Court relatively soon," he said.